The Flufftastic Commercial Cotton Candy Machine from “Great Northern Popcorn”, is manufactured by to the highest quality standards and offers quality products at affordable prices. Although hard candy can also be used in this machine to make sugary delights, it is more difficult to pull off the cone than ordinary sugar floss as it becomes very sticky and could result in an unfortunate candy floss experience. 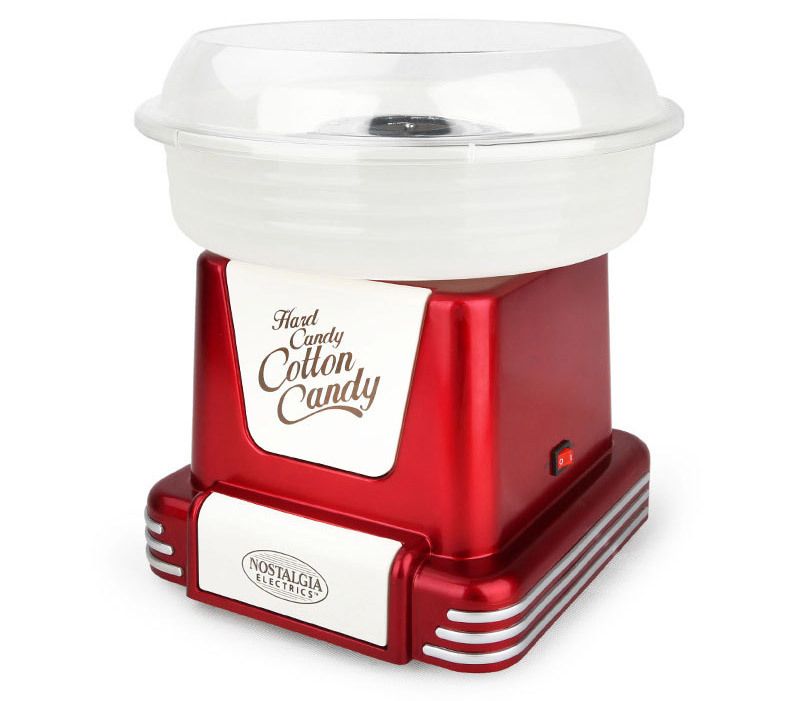 This device ensures a quiet design so that no noises will disturb the making of sweet cotton candy fun that this machine offers. Although this device is offered at a lower price point, this cotton candy machine boasts many safety features such as a built-in fuse, a front-facing ON/OFF button, a long sugar scoop which makes it safer to place the sugar into the kettle, and the wires are shielded from the hands by the metal bowl. The design of this cotton candy maker is appealing because of its fun, bubble blue paint finish, and is sure to intrigue any cotton candy lover. This machine is painted using a premium paint finish which will ensure many years of cotton candy floss fun. This cotton candy maker is made with a 30% premium grade thick steel, which will help to prevent wear and tear. With a high efficiency power output of 1000 Watts, this machine is able to produce one cone of sugary cotton candy floss every 30 seconds. There is an initial warm up period of up to five minutes but once the machine is warmed up, the power stabilizer kicks in which will help to lower the machine’s electricity usage. 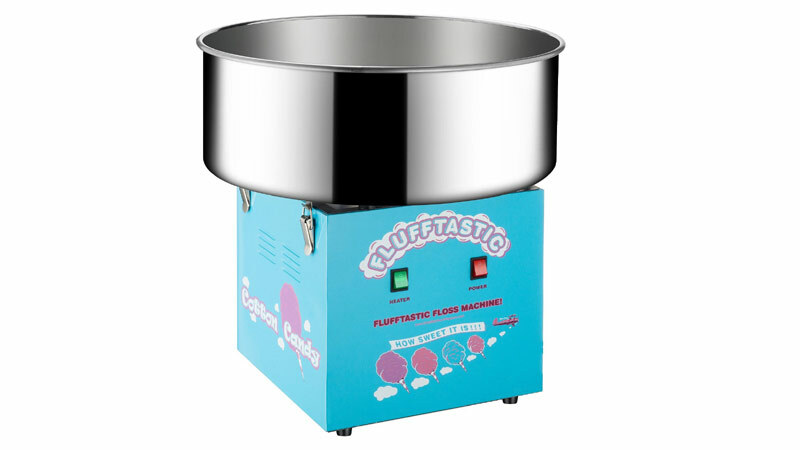 An option to purchase a Cotton Candy Machine Floss Bubble Shield to prevent sugary bits from escaping the bowl whilst in use, is also available. The metal bowl (which has to be ordered additionally) is 20.5 inches in diameter which allows one to make a lot of cotton candy per each fill. This machine weighs approximately 30 pounds, which makes it a heavy load to carry around, but, it is smaller in size with a width of just 13 inches, which means that this machine will take up less countertop space in the kitchen. This machine also comes with a quality 1 Year Warranty.